“You’re an old folkie. You might be interested in this”, a work colleague observed, passing me a clipping from the Melbourne Age. “This” was an advertisement for a joint appearance at the East Brunswick Hotel (March 1999) of four of the best-known folksingers of the 1960s: Martyn Wyndham-Read, David Lumsden, Brian Mooney and Danny Spooner. The occasion was the launch on Compact Disc of the landmark album Moreton Bay, originally released on the Score label in 1963. The evening in question proved to be much more than just the reissue of a historic LP. Investing their renditions of well-worn old songs with all the skill and musicianship they had acquired over four decades of performing, the artists played to an audience largely drawn from old regulars at the legendary jazz and folk venue Traynors. For everyone involved, it was a joyous and memorable get-together. Reference was made to the 60s folk scene throughout the evening; David Lumsden paid affectionate tribute to pioneer singer Glen Tomasetti, and Andrew Pattison raised a toast to the memory of three other artists closely associated with Traynors, Trevor Lucas, Graham Squance and John Graham. Fittingly the evening closed with the perennial ‘Wild Mountain Thyme’, sung en masse. boom. Invariably mention of Traynors elicits affectionate smiles or a hint of nostalgic tearfulness from old patrons and performers alike. For many a Melbourne baby-boomer, Traynors embodies the ‘60s folk scene. There has been a surprising amount of disagreement over the venue’s starting-date, ranging from late 1961 [Pattison & Mulholland, Graham Simpson] to February 1964 [Davey & Seal]. 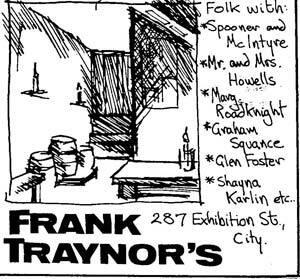 The magazine Music Maker is more precise; in his ‘Melbourne Roundup’ column for October 1963, Jack Varney noted that Frank Traynor had recently taken over premises at the corner of Exhibition and Little Lonsdale Streets with the dual object of presenting folksinging and staging jazz parties to pay the rent on the building. (Varney failed to observe that the building had recently seen service as a brothel). Veterans of the Melbourne music scene believe that the formal presentation of jazz and folk at 287 Exhibition Street grew out of the 1963 Emerald Hill concerts (See Part 1). 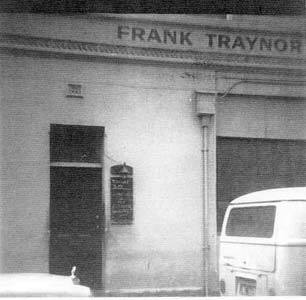 As founder of the Melbourne Jazz Club and leader of the enormously popular JazzPreachers, Frank Traynor (1927 – 1985) has been credited with initiating the Australian Jazz revival of the late 1950s-60 and with revolutionising its presentation. “Frank promoted jazz with a fervour verging on the religious”, notes Mary Traynor. “It didn’t matter where he played, or what occasion, as long as people heard jazz. He called it ‘spreading the word’”. For several years (1958-63) the Jazz Preachers held a summer residency at the Wild Colonial in Lorne, and it was there that he first connected with the folk revival through friendships with Glen Tomasetti, Brian Mooney and Martyn Wyndham-Read. Years later Traynor recalled: “There was a natural affinity between folk and traditional jazz musicians at the time. They had mutual respect for one another, particularly because they were both taking their music from folk roots, they were both a bit underground, they were both totally sincere in what they were trying to do with their music and had a great personal belief in it; there being a message of truth in the music”. established the Little Reata in the city, hoping to redirect most of the folk trade there. As it was, the new venue encountered similar problems; by now Lazar had lost interest. (The two cafes had ceased to operate as folk venues by the end of 1964). What Traynor visualised, therefore, was a music club first-and-foremost, where folk and jazz musicians alike could play “the music they wanted to play” to appreciative and attentive audiences, and be decently remunerated. The timing was opportune. His bank account was comfortably “in the black” thanks to a day job (with the National Bank) and a particularly hectic season with the Jazz Preachers. Glen Tomasetti, meanwhile, was looking for somewhere to transfer her Sunday Afternoon Folksingers & Minstrels Club with the end of the Emerald Hill tenancy looming. Traynor earmarked 500 pounds to get the club started. An idealistic musician first and foremost, with little time for the diplomatic niceties required in a “people industry” (and a real skill for delegating responsibility), he promptly recruited two acquaintances from the jazz world to take on the day-to-day management. (Jim Beal and Don Carless were already known to each other from their days with the circus. Carless had previously come into contact with folkmusic via Brian Mooney at the Arab Café. Visiting the Troubadour, the Sydney folk venue established by businessman Jim Carter, had reinforced his interest).